The best in Red Carpet hair care by Gloss & Toss. It’s no secret that celebrity beauty and Hollywood hair is the talk of every beauty ritual. At Gloss & Toss we take great pride in knowing these trends because we work with them. This season we’re proud to reveal our hair care sets created for 4 very specific hair types. See which hair type best describes your daily needs and concerns. At Gloss & Toss we believe beauty should be approachable! These products are like a partner to my blow-dryer! 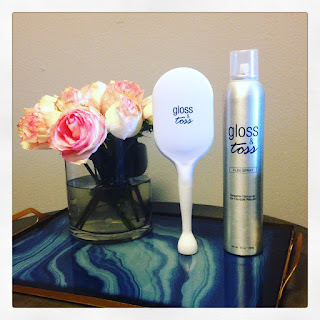 Gloss & Toss Detangle Brush: You just changed my life! GREAT brush: Styling time dramatically cut down. “Do” now looks great. Not kidding. Gotta lotta hair and I’ve given into my Silver Fox self this year Translation: Gray hair is wiry. No longer with Gloss & Toss Detangle Brush. AB FAB. Thanks so much for a terrific product that makes me look incredible in a fraction of the time. xoxoxoxox! I really like the adjustable feature of the hairspray. I had a special event (all day) and my style held up beautifully and my hair looked and felt very natural! Another great product from Gloss & Toss. What i love about this hair spray is that it is not overly sticky like some hair sprays. Goes on easy and holds very nicely. Great product i would recommend! The Sea Salt Spray really helps tired curly hair feel alive again. I like how light it is.